© John H. Griffith-Davies, 2017. Everyone is familiar with the Legend of King Arthur, which is a fictitious story that was concocted by the first great French novelist called Chrétien de Troyes in about 1165, who unscrupulously distorted the facts with his ‘poetic licence’ and modified the names of the characters and places to suit his Frankish audience too. He even invented characters such as Sir Lancelot! His tale became very popular to such an extent that it circulated around the Holy Roman Empire (where Burgundy, Germany and northern Italy are situated nowadays) for several centuries and it became ever more fantastic as other authors embroidered it. The so-called Heidelberg Manuscript is the synthesis of these myths, whereby Arthur was transformed into a chivalrous Christian knight who belted around the Mediterranean searching for the Holy Grail and encountering various natural and supernatural hazards on the way, rather like a latter day Odysseus. Absurdity itself! Chretien based his novel on a genuine history that had been written six centuries beforehand by the Welsh priest and monk called Saint Gildas, who had witnessed the important historical events at first hand in Caerleon (Camelot): this detailed and undoubtedly impeccably accurate historical record - it was a mortal sin for any priest to lie - was bought in the form of a book by Walter de Mapes (who was indeed a Welshman despite his Franco-Germanic name) in Brittany around 1160 during one of his trips to France as Henry II’s ambassador (Brittany was a separate country at that time). Walter could not fully understand the text because the Welsh and Breton languages had changed considerably and also diverged greatly from each other since it was written but he did recognize its importance, so he gave the book (or perhaps a copy of it) to his learned friend Gruffydd ap Athrwys (Geoffrey of Monmouth in English) to translate it into Latin for him, which was the ‘lingua franca’ of cultivated circles in those days. Walter passed on the translated copy to Chrétien during one of his trips to the French court in Paris (the town of Troyes lies close to Paris in the south-east and it could be easily reached by horseback or coach within a day). Walter might indeed have re-translated the book into French before giving it to Chrétien because he had studied at the University of Paris and therefore spoke French fluently. Let’s take a look at the facts: first briefly and then in detail. This description is based on my own independent research of the surviving original records that were written in Welsh and Latin. It has nothing to do with the half-baked essays that were written by Victorian, later and contemporary historians. 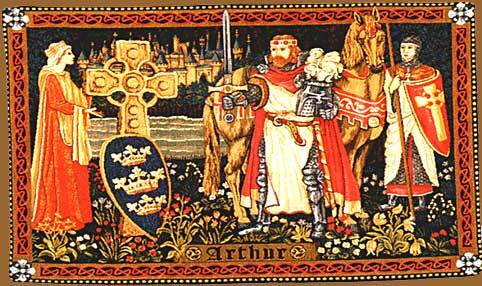 ‘King Arthur’ was a Romanized Briton called Brenin Athrwys (King Bear Man). He was the eldest son of Gwythr Pen y Dragon (Uther Pendragon), which signifies ‘Victorius Chieftain’ and he was the king of the fierce Silurian tribe that lived in South Wales: this tribe was the most important and loyal ally of the Romans in western Britain. Athrwys was born in 480 A.D., give or take a couple of years. His second wife (Welsh law permitted a man to have 2 wives simultaneously) was a Cornish woman called Gwenhwyfar (Guinevere), which means ‘Blessed among others’, whom he married in about 510 A.D. when she was exactly 15 years old. It is important to note that Gwenhwyfar is a uniquely Cornish name (the English version of it is Jennifer). He met her at the court of his best friend King Cadwyr of Cornwall in his fortified capital of Din Dagel (Tintagel) where she had been safeguarded as a little girl following the murder of her parents by Saxons, i.e., she was literally a ward of court. Gwenhwyfar was astonishingly beautiful, which earned her the nickname of ‘White Enchantress’ later on in Caerleon. However, I believe that Gwenhwyfar’s beauty masked a callous and scheming character! Athrwys already had two sons by his first marriage who were the elder Gwydre and the younger Llacheu (his wife’s name has not survived the passage of time but she was probably a Cornish woman, as were Athrwys’ own mother and stepmother too). I am basing the following conjecture on three apparently unrelated and undated facts. Firstly, Llacheu’s elder brother Gwydre was killed along with two of his attendants while out hunting an enormous boar which gored them (I estimate that this happened around 523 A.D. when he was about 22 years old). Secondly, Athrwys killed his only son with Gwenhwyfar, whose name was Amhar (Amir). Thirdly, Gwenhwyfar ‘took the viel’. Llacheu became the next in line to the throne after Gwydre’s death. Gwenhwyfar bided her time until Amhar came of age (he had been born in about 510 A.D.), then she convinced him to kill Llacheu in such a way that the latter’s demise would appear to be yet another unfortunate accident, in order to ensure that her son would eventually become the next king (naturally with Gwenhwyfar pulling the strings) after Athrwys died (he was about 20 years older than her) but Athwys foiled the plot and killed Amhar instead. Athrwys spared Gwenhwyfar by banishing her to the convent of Saint Julius’ Church where she could eternally repent. .
Athwys became the first king of Caerleon about 15 years after he had married Gwenhwyfar and he reigned for exactly 10 years. He was buried in 537 A.D. within the Welsh pagan religious centre that was located on the largest of three islands in the nearby tributory of the River Usk called Afon Lwyd (Avalon).